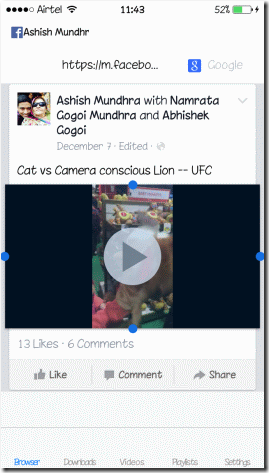 However, there’s no direct way you can download a Facebook video to your iOS device and then share it. But there’s an app for that. Using this app you can directly download videos that are not protected by copyright claim. Having done that, these videos will be saved to your Camera Roll and can then be shared immediately. There are many ‘free’ apps that claim to help you download videos, but it took me a while to find an app that really works without having to pay for it. All the others demanded in-app purchases in order to save the videos to the camera roll. 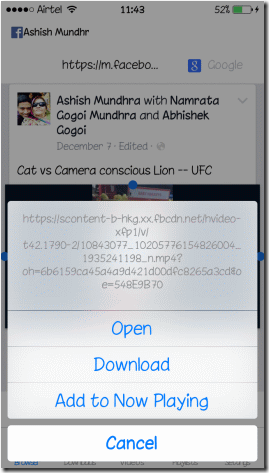 So to get started, download Video Downloader Plus from the App Store and launch the app. When it opens, you’ll see a browser page where you can open any website using the URL. 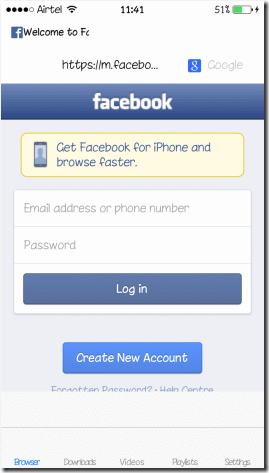 Facebook is the source from where you want to download, so log in to your fb account. Once you have logged in, you will be able to browse Facebook just like you do in a normal browser. So now when you need to download a video, long tap to highlight and select Download. The app will ask you for a file name for the video and then download it. Once the video is downloaded you will have to save it to the camera roll by tapping the information button next to it. Note: The app cannot download materials that contain restricted property rights, such as videos from YouTube, Vemo etc. The app maintains a blacklist file and the download button will not appear on non-supported websites. That’s all – once the video is saved to your camera roll, everything is in place. You can now open apps like WhatsApp or Hike and then simply upload these videos from your iPhone’s camera roll and send it to your friends and other groups. The app also has some additional features you might like. 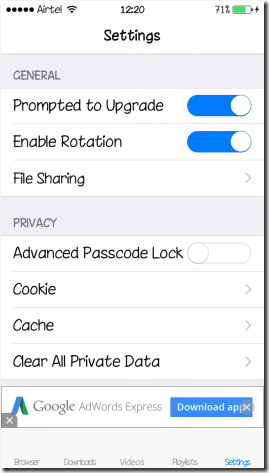 From the settings, you can protect the app and all the downloaded content using a passlock. Another interesting feature of the app is that you can turn on the HTTPS streamer and then access all the videos you have downloaded on another browser, and download that content. So that was how you can download videos from Facebook onto your iOS devices, save them to the camera roll, and then share them via WhatsApp and Hike (or any other such platform). 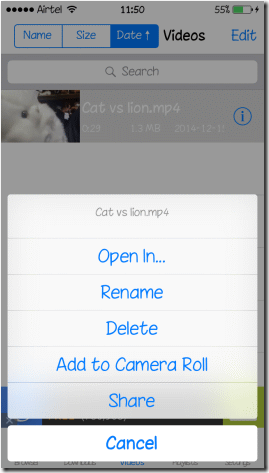 FreeVideo Downloader Plus is just one of the many apps that worked for me. However, if you would like to recommend any other app that you think is feature rich and makes the task easier, don’t forget to share it with us.